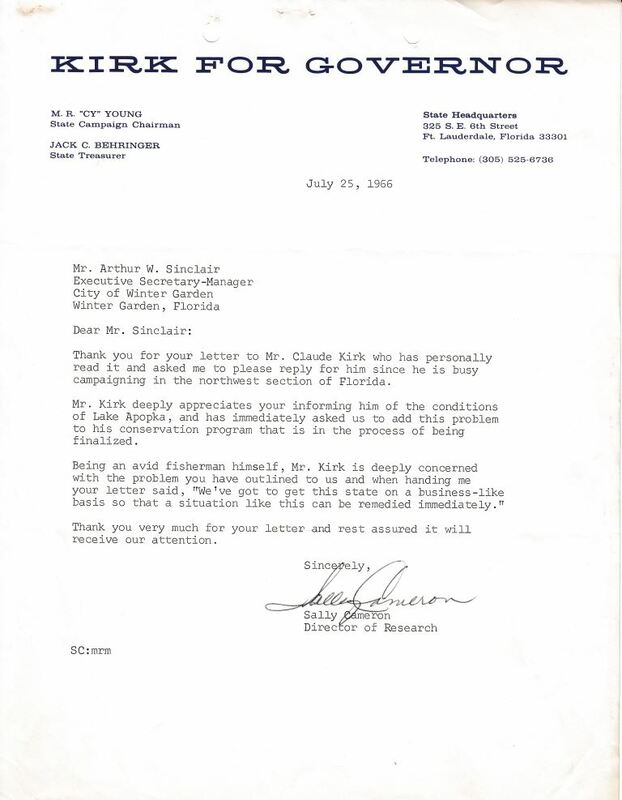 A letter from Sally Cameron, Director of Research for Claude Roy Kirk, Jr.'s (1926-2011) gubernatorial campaign, in response to an earlier letter from Arthur W. Sinclair, the Executive Secretary-Manager for the City of Winter Garden, asking for future action on Lake Apopka if Kirk becomes governor. 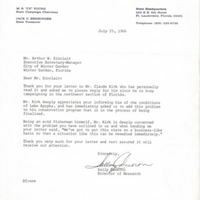 Cameron writes that Kirk has personally read Sinclair's letter, and has included Lake Apopka restoration within his conservation program. Claude Roy Kirk, Jr. was elected governor in 1966, and formed the Florida Department of Environmental Protection during his time as governor. Original typewritten letter from Sally Cameron to Arthur W. Sinclair, July 25, 1966: binder 1966, Friends of Lake Apopka Archives, Ginn Museum, Oakland Nature Preserve, Oakland, Florida. Digital reproduction of original typewritten letter from Sally Cameron to Arthur W. Sinclair, July 25, 1966. "Letter from Arthur W. Sinclair to Claude Roy Kirk, Jr. (July 13, 1966)." RICHES of Central Florida. Originally created by Sally Cameron. Cameron, Sally. “Letter from Sally Cameron to Arthur W. Sinclair (July 25, 1966).” RICHES of Central Florida accessed April 22, 2019, https://richesmi.cah.ucf.edu/omeka/items/show/6843.